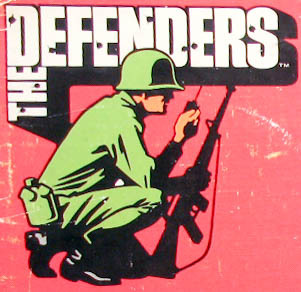 Hasbro introduced The Defenders in mid to late 1975 alongside the last of the Adventure Team sets. This line, though technically not G.I. Joe, boldly advertised itself as fitting our favorite action figure. Many of the accessory sets include items previously released for G.I. Joe. It's interesting that after working so hard to divest Joe from his military origins, The Defenders is unapologetically combat oriented. The quality of the sets is similar to the late issue Adventure Team accessories, except for the figure itself. It is articulated only at the neck, shoulders, and hips, a mere shadow of his proud progenitor. The line is included on the site as additional reference. 360 spins for these sets won't be provided at this point.